Welcome to Cos Kai. This two-story luxury villa is a great family, or multiple-couple, home offering amazing sunsets and barefoot swimming from a palm-shaded beach. Boasting over 6,000 sq. ft., Cos Kai is only a 5-minute walk from the Kaibo Yacht Club to the south and a 10-minute walk to the Rum Point Club to the north. From the moment you enter the heavily landscaped carpark, Cos Kai welcomes you to a luxurious private enclave on the Caribbean Sea. 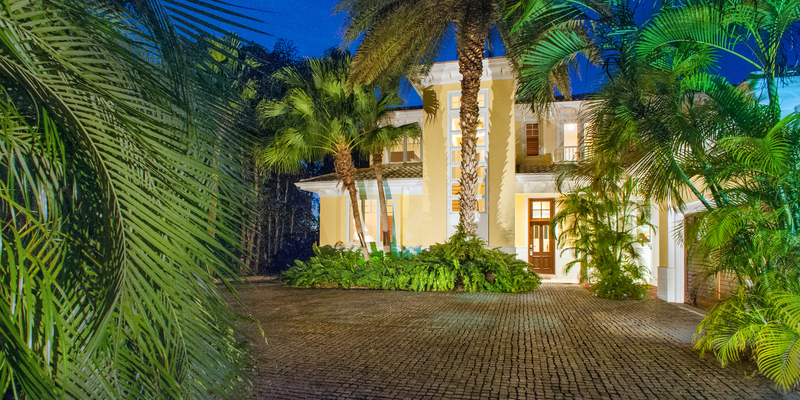 Mature palms, ferns and ornamental shrubbery evoke a tropical feel before you even enter the front door. Once you enter, your eyes are drawn through the living room's 16 foot wall of windows and out to the white sand beach and shimmering calm blue water. 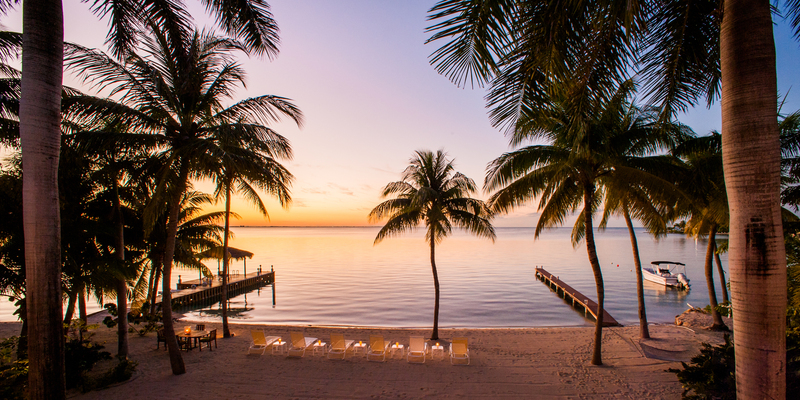 The palm-shaded barefoot beach is dotted with 6 lounge chairs, a hammock, an outdoor shower, a private dock, plus an outdoor dining set and propane grill for beach cookouts. Stunning sunsets! 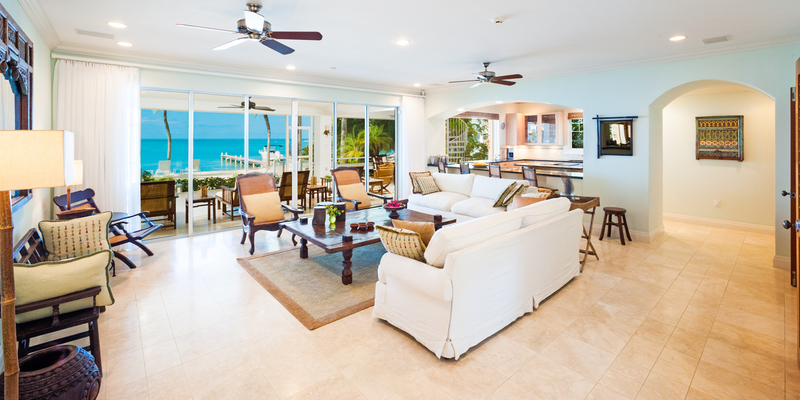 Cos Kai is fantastically located with unbeatable views of the azure waters of the Caribbean. Facing Northwest, Cos Kai sunsets are truly breath-taking. 1 tandem kayak and 1 single kayak included with the villa. 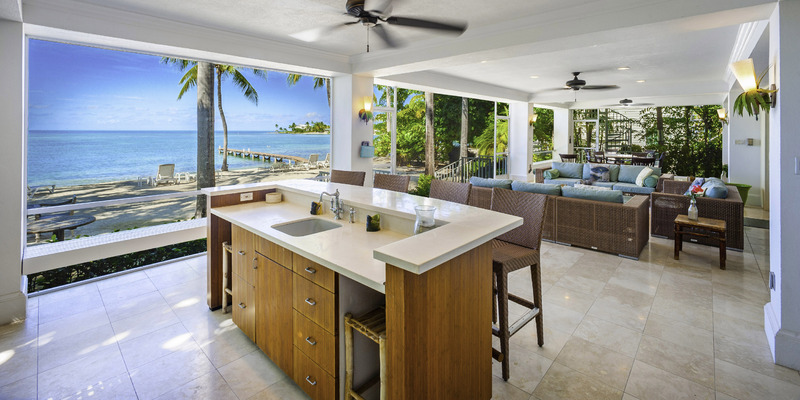 A fully equipped gourmet kitchen with pass-thru to the screened veranda, a breakfast bar, high-end stainless steel appliances, and granite counter tops. 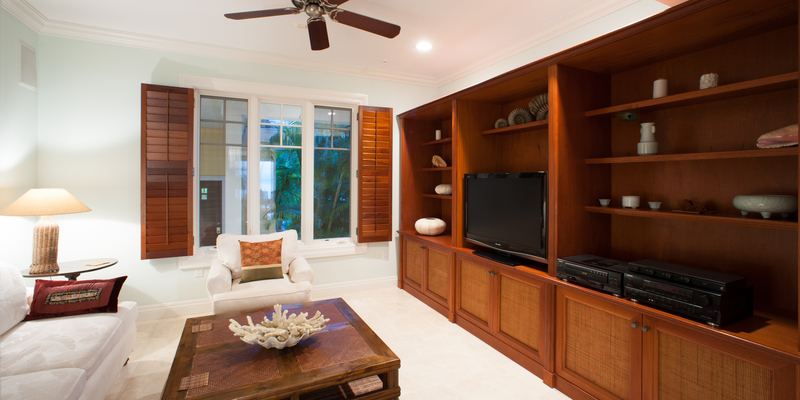 Media room with 50” flat screen TV with cable programming, DVDs, CDs, board games, and a home audio system with connectivity to your devices. 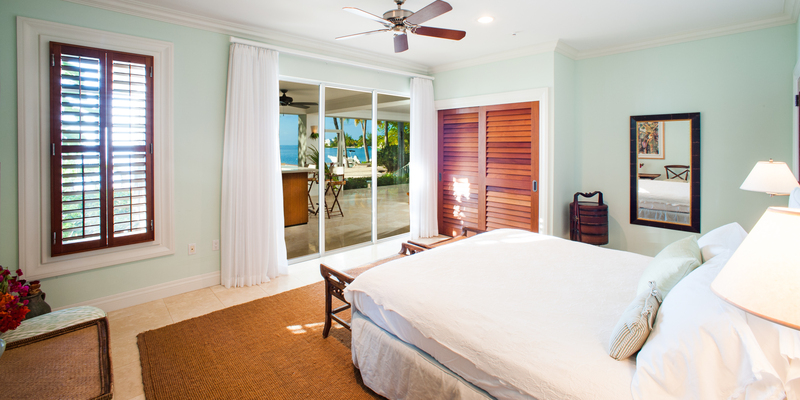 Multiple oceanfront sliding glass doors provides a pleasant cross-breeze through screened openings. Integrated loud-speaker system on the ground floor and veranda provides mellow background to peaceful airy living. Exquisite high-end furniture, travertine and bamboo floors, granite counter tops and high end appliances ensure that your every need is met. Dedicated laundry room with 2 washers and 2 dryers. Wooden internal shutters and black-out drapes ensure a perfect nights’ sleep. 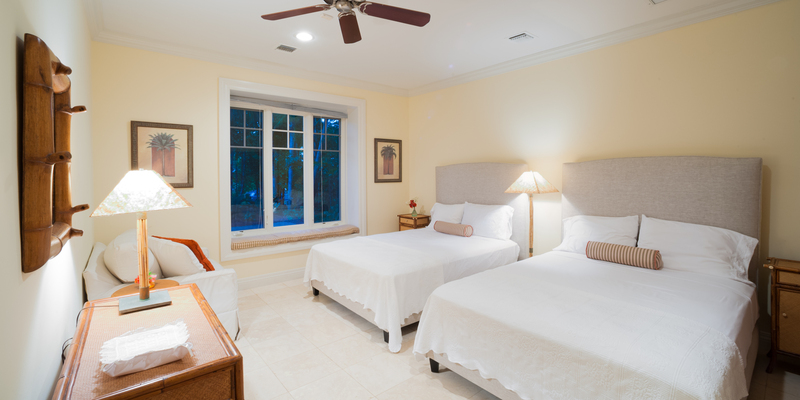 High-thread count Egyptian cotton linens, luxury towels, toiletries, and beach towels all provided. 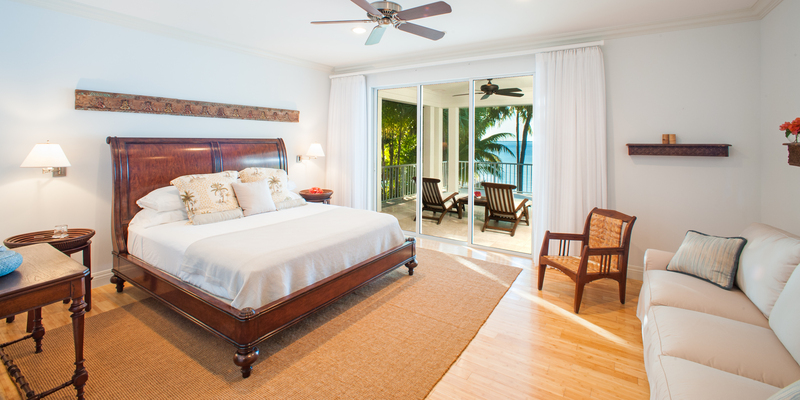 Suite #1 - A soft green oceanfront king master suite for 2 with ensuite bath and direct access to the screened veranda. Suite #2 - A double-queen suite with garden views and ensuite bath for 2-4 guests. Comes with a twin sofa bed for an additional guest. 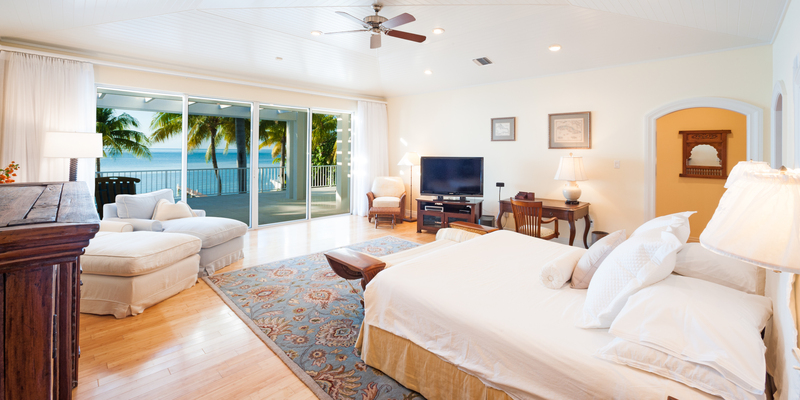 Suite #3 - A soft blue oceanfront king master suite with ensuite bath and queen sofa bed for an extra 2 guests. 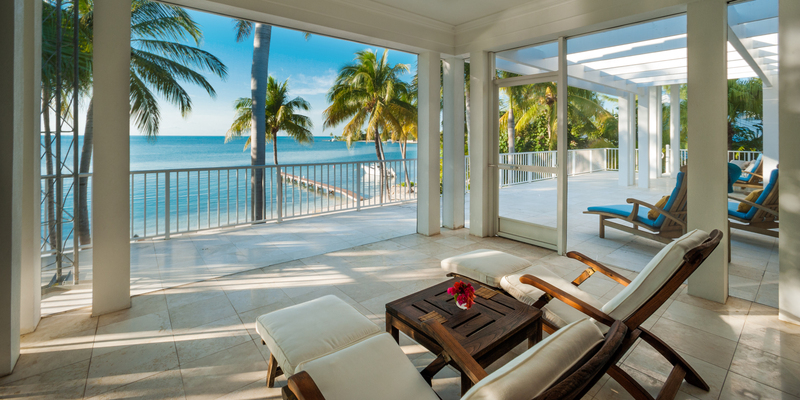 This room has its own screened balcony with lounge chairs. Bedroom #4 - Bunk room with new twin-over-full bunk beds and a new crib. Room also doubles as a library, with a selection of books to choose from. Grand Master Suite #5 - Enormous oceanfront king master suite with separate sitting area and brunch nook with fridge, ice-maker and coffee machine. Furnished with queen sofa bed for 2 additional guests. 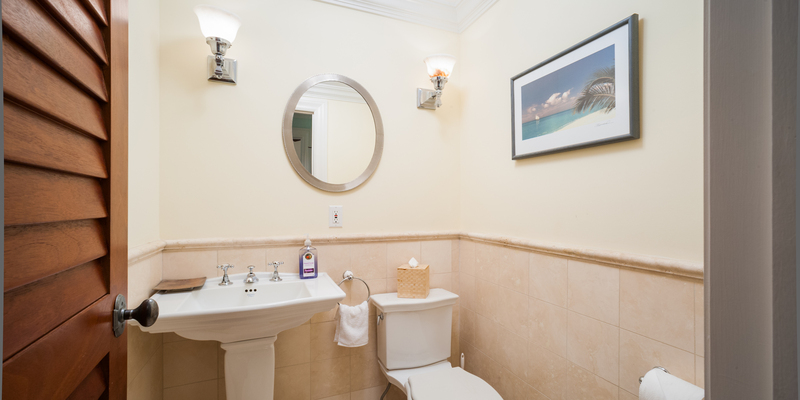 Suite comes equipped with flat-screen TV with Bose surround sound DVD Player, a large walk-in closet, a private balcony, a partially covered sun-deck, a private ensuite bath with stunning walk-in shower with ocean views. (B) Full 5 bedroom house without sofa beds: sleeping a maximum of 10 guests at a lower rate. 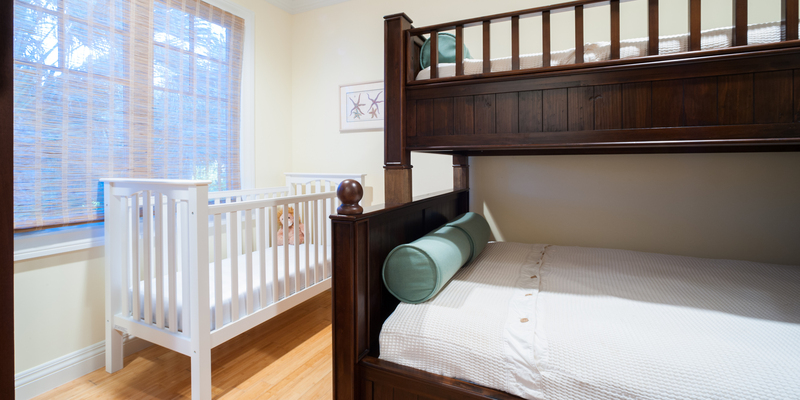 Housekeeping or nanny service is available at an extra cost for a minimum of 4 hours. Services arranged directly with on-island property manager and paid directly to the maid or nanny on the day of service. Hosting special events can be accommodated. There will be an event fee and supplemental refundable damage deposits required by the owners. Cos Kai is beautiful, well stocked and comfortable. We loved Cos Kai. We used all 5 bedrooms and each was cool and comfortable. The kitchen was the best we have ever had in a rental. The 2 ice makers and refrigerators were wonderful.The beach and water were just as in the photos. Rum Point and Kaibo were very close and we enjoyed both, especially the Beach BBQ at Kaibo. Claudia was very helpful with her answers to our questions and her suggestions. We developed a problem with the A.C. in one of the bedrooms and she had someone there to fix it first thing the next morning. Eddie doing our grocery shopping was great. There were 11 of us and we had plenty of room to gather. We definitely recommend Cos Kai. We had six adults and seven children in this home and we all fit so comfortably! 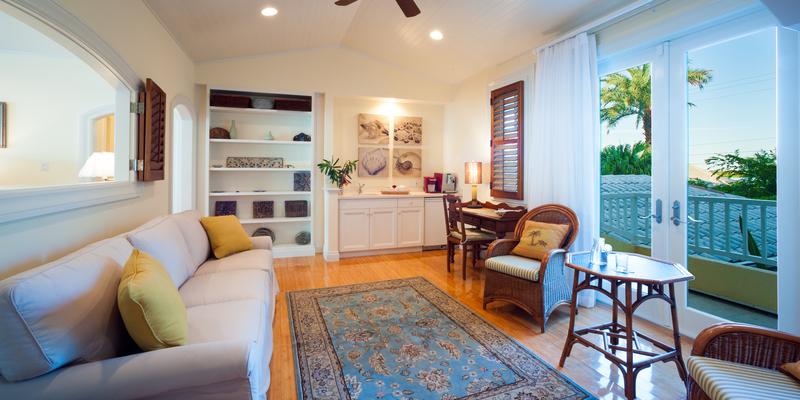 It was very clean when we arrived and the house manager was always just a phone call away if we needed anything. The house was fully stocked so not much was needed! The view and location is amazing! Gorgeous sunsets every single night, kayak rides to bio luminescent bay, a fifteen minute beach walk to Star Fish Point, and nice running paths for my early morning runs! Close to Kaibo Marina and Rum Point beach! So many memories made and loved our stay at Cos Kai! Perfect house for a week of family fun! Property is even nicer than the photos! Claudia is fantastic to work with. Would recommend the home to everyone. 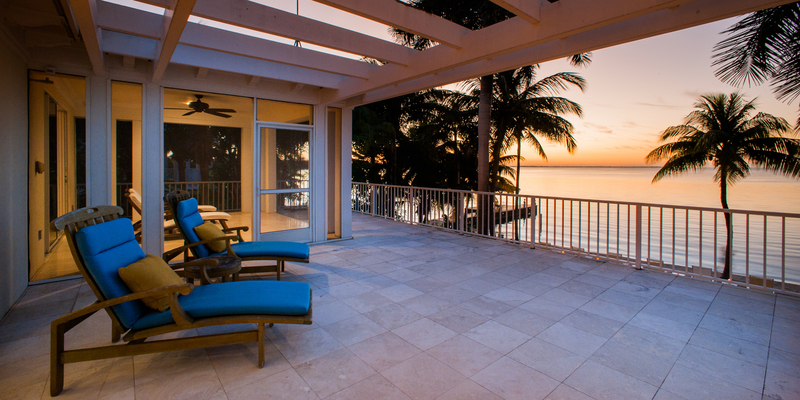 We arrived the 12/26 to the Cayman Islands and walked into the most amazing house with the most spectacular view ever!!! The house was perfect! We had 10 adults in our party and not one time was there ever a time that the house seemed crowded. 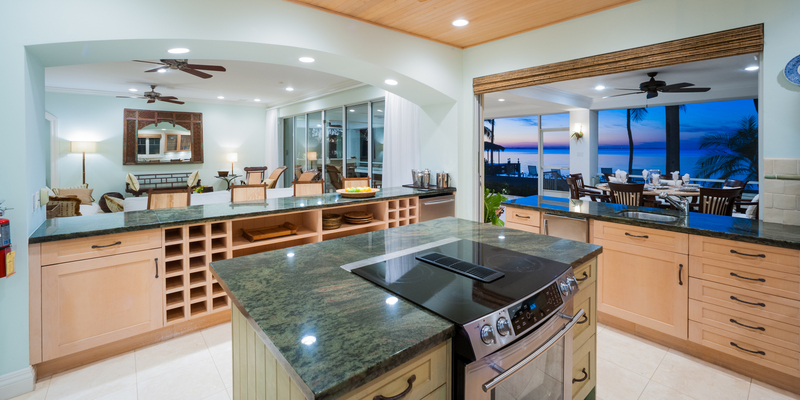 The kitchen is equipped with everything you can possibly imagine having available to use for cooking. The beds were super comfortable and the bathrooms were amazing! We would get up each morning with at least 3-6 starfish right there on our beach. Snorkeling was amazing right in your own back yard. Waters were calm, even though the seas were a bit rough from the winds that week. Walking the beach daily was one of the highlights of the trip. Breathtaking doesn\'t even half way describe the views and the vibrancy of the colors. An amazing trip that I would recommend and if you can stay at Cos Kai I would highly recommend that! We have a wonderful time here at Cos Kai! We traveled with 3 other families, two of whom stayed at Tarasand across the water. We celebrated both a 50th and 16th birthday, as well as Thanksgiving. Cheers for Delaware! We are part of the above group! Best time ever! This villa is amazing! We will spread the word about the villa and will also be back very soon!! We had a girls reunion, came from Virginia, North Carolina, and Utah. Awesome home, well equipped, everything we needed and much more! The Rum Point Restaurant was EXCELLENT! The house is just as the pictures show, absolutely beautiful! We loved the calm water for our young ones and the screened in porches were so perfect to stay away from the bugs. All the fans made it very comfortable. The large house and all the space was great for our party of 11. We enjoyed our trip and all the activities we did! We celebrated our grandparents/parents 50th wedding anniversary, with a dinner on the beach and lots of other fun activities including snorkeling, scuba diving, stingray city, and overall just exploring the island. The house was perfect for all 14 of us to get together, it provided us with all the wonderful amenities, so we could just relax and enjoy each others company. The kayaks were great, we got to go out and see all of the fish and big starfish, plus at night we saw bioluminous bay light up. Overall the trip was amazing and very relaxing! Sunsets were gorgeous! We all had a marvelous time enjoying this amazing house and beach! Our memories will last forever! Wonderful house, beautiful location. Our family had a great time! We loved going to Rum Point and Starfish Point! Also the Kaibo Yacht Club was great for dinner - the beach barbecue was awesome! We saw a nurse shark by the dock last night. Thanks for sharing your wonderful house with us! We thoroughly enjoyed. We had a fabulous relaxing stay in your beautiful home on the ocean. The views are endless and breathtaking in all directions. Loved the kayaks and long walks on the beach! And the sunsets! WOW!! This was our 8th visit to Grand Cayman and Cos Kai was definitely our favorite villa on the island. We spent a lot of time out in the fabulous screenroom as well as on the beach. We hit all of our favorite spots - Over the Edge, Tukkas, Vivine\'s Kitchen, and the Lighthouse for dinner. We spent time at Kaibo, Rum Point, and even spent an afternoon in Georgetown. Your house was wonderful! Loved the location with the clam water. It had everything we needed and more. Looking forward to coming back! We came to Grand Cayman for a few days of relaxation and Cos Kai was the perfect choice! Your lovely and well appointed home exceeded our expectations and the beachfront is just so pleasant and serene. We look forward to coming back and bringing along the rest of our family. Thank you for a lovely vacation! Our stay could not have been better! Your home is exquisite & perfectly styled & decorated to make your guests feel comfortable & welcome. We loved Rum Point & all the attractions. Hope to see you again some day! This place is an absolute paradise! We could not have had a more perfect place to stay. We enjoyed kayaking to the bioluminescence and our walk/swim to Rum Point. The boat charter to swim with the stingrays is a must! Would definitely like to come back. Thank you for an unforgettable trip! We just returned after spending seven great days at Cos Kai. The house is very well maintained and is just as beautiful as the pictures. The entire management team was great to work with. Pam, the property manager, made sure we had everything we needed to have a great time. There were eight of us. My wife and I, our four adult children, and two friends. We had plenty of room, and it never felt crowded. The beds are very comfortable, linens are of high quality, and the furniture is very nice. The screened in porch is very large and a beautiful place to eat and relax. The owner just added three high quality outdoor couches that are very comfortable. We spent a lot of time there taking in the incredible water view and enjoying great family time. 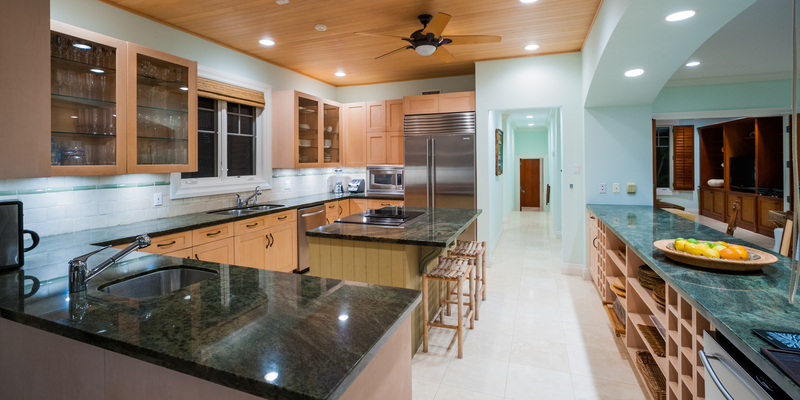 The house has double washers and dryers, three coffee makers plus a Keurig, multiple ice makers, a large refrigerator/freezer, outdoor bar refrigerator, and more kitchen supplies and spices than the normal home. It is very well equipped. We used the grill to BBQ almost every day. It\'s a good size and in very good condition. We arranged two boat charters with Silver Thatch Charters, and pre-ordered a stand up paddle board and float from the rental company, empty suitcases. I recommend both of these companies. The house comes with a couple of kayaks and some floats, however if you have a large group, you may want more toys. The water is very calm which is great for floating! I would recommend people consider water shoes to protect your feet from shells and sea life when walking in the water. When we booked this trip, we were looking for a luxurious home with a lot of privacy. This house exceeded our expectations. Cos Kai is beautiful, we\'ll stocked and comfortable. Our stay at Cos Kai was wonderful. We had 13 people including 6 kids with enough room for all of us. 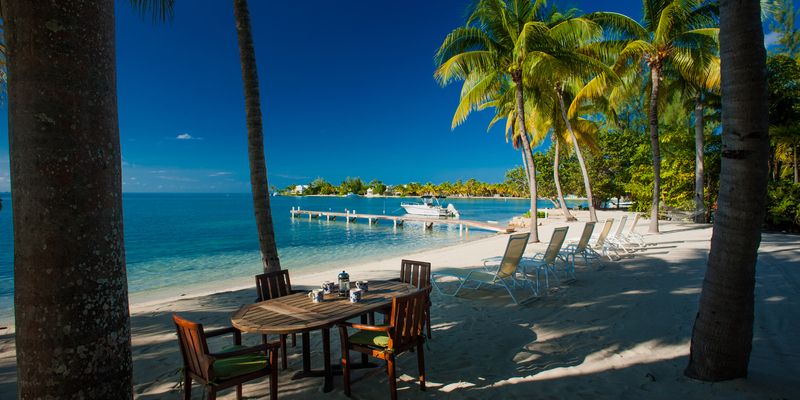 It is a quite location with Rum Point and Kaibo restaurant walking distance from the house. The Red Sail Sting Ray City tour out of Rum Point was fun and convenient. Claudia the manager was very helpful with any questions we had including pre ordering food to be delivered to the house. We came in late on Saturday the house was stocked with our pre ordered food which was helpful to not have to go out and shop. The house itself is very well kept and clean. Our overall experience was great. We loved our stay at Cos Kai! The layout was perfect for our family of grown children. We spent most of our time in the back porch area. Perfect for morning breakfast and evening card games! The hosts were very attentive and made sure everything was perfect for our stay. The Rum Point area is the quieter side of the island and we enjoyed it. Close walking distance to a couple of restaurants. Beautiful snorkeling. We couldn\'t have asked for anything better! We will be back again. Unbelievable Oceanfront Experience. One of a Kind Location! Cos Kai is stunning. The house is BIG. We had a family of 12 with everyone in beds and plenty of room. And no tripping over each other in the evenings. Its spacious and comfortable. But the back of the house is the true gem. Awesome screened in porch that seats everyone. Big dining table to eat at. Then you go outside and enjoy your own personal beach with water as calm as a swimming pool. We had windy, stormy days a few times during our trip...it never made the water even ripple behind our house. It\'s THE best beach experience for kids of all ages and grown ups who like to swim or relax on a floaty like you\'re in a swimming pool. And Pam, the house manager, is on the spot to help you with anything you may need. Just a great experience. The perfect family getaway - stunning location, tastefully furnished, plenty of room. We had to tear ourselves away at the end feeling very relaxed and regenerated. We would go again without hesitation. Our stay at Cos Kai could not have been better. The booking process was easy and seamless. For some reason we felt more comfortable dealing with a company based out of Richmond. Everything was answered quickly and accurately. The property itself was one of the first places that the actual house was better than the pictures which were thorough and professionally taken. It was beautifully designed and furnished. We all truly felt we were staying in a friend’s home. Cooking there was a pleasure, easy and fun because we had everything we needed. Several of us had to work while there and since it was so spacious and comfortable it made work seem like play. Our dinners were wonderful family events that none of us will forget. I cannot think of a single shortcoming. Our on-island property managers were the home owners. They were both perfectly wonderful people. My only regret is that I didn’t have the opportunity to meet either one in person. Claudia was so helpful and accommodating beforehand in the planning. We wanted to have a cook come in one evening for a birthday celebration and Claudia recommended the perfect chef and hostess. It was actually the best meal we had on the island. We had a small problem with the shower and they had someone out there to fix it that day. The neighbors were wonderful and it was clear they all looked out for each other. The house amenities were everything we wanted. We never turned a television on but if we were so inclined there were plenty. The house sound system was awesome and the ocean kayaks were used daily. The house wifi was crucial for calling, data and emails. We had to at least sound concerned while having breakfast on the beach during the largest snowstorms to hit the east coast in decades. Other than a couple of trips to grocery stores and airport we stayed at Cos Kai which was exactly what we wanted to do. We could not recommend it more. We recently stayed at Cos Kai, and it was by far the best rental we have had in our yearly Cayman vacations! We had to families of 4, with 4 kids under the age of 4. The home was perfect as my family stayed on the 2nd floor, and the other family stayed on the 1st floor. We had plenty of space, and the beach was perfect for our children. 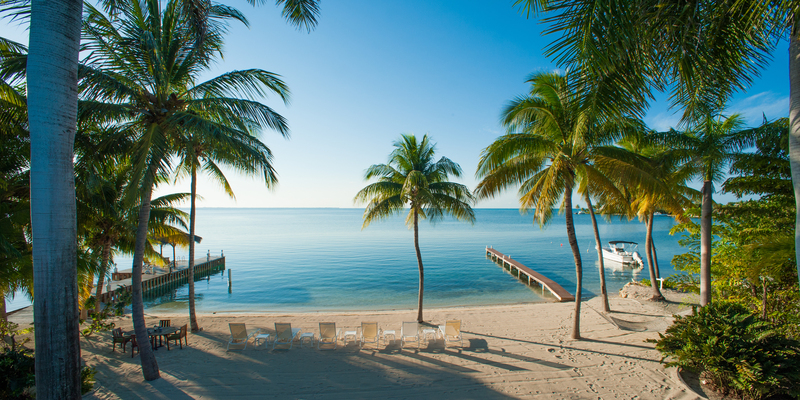 The location is also perfect as we could walk to Rum Point or Kaibo Yacht Club. It was truly a home away from home as we had no needs the entire time that we were there. Claudia was even kind enough to help us find a reliable sitter for one of the evenings, so that we could go out to dinner. Great stay, we already looking forward to next year’s trip!! We decided to escape the crowds in Europe this summer and it was the best decision we made for our holidays ever! We absolutely loved our time in Cos Kai in idyllic Grand Cayman. The house is huge and exquisitely furnished. All rooms are very spacious and airy. All very elegant, yet practical. We had everything we could wish for to make our stay relaxing and comfortable, from the appliances to the very comfortable beds. A big hit for us and our kids was the outdoor areas. We dined alfresco everyday in the enormous varanda and loved watching the sunset from there (there is a bar area) or from the beach and pier. Our 9 and 6 year-olds had a ball jumping from the pier into the warm Caribbean sea. They repeatedly spotted some \"residents\" under the pier: a cute family of Angel Fish and a lobster!! The house is very close to restaurants in Kaibo and Rum Point, where we hang out when we felt like socialising. I would highly recommend Cos Kai! Great Stay for the "Great Eight"
We absolutely enjoyed our stay at Cos Kai. Four couples. The Great Eight travel together to the Caribbean every 2 years. This was our 8th trip,. Everything was smooth from the time we decided to book until we left. Any questions we had about the villa before booking were answered quickly and honestly which is very important. 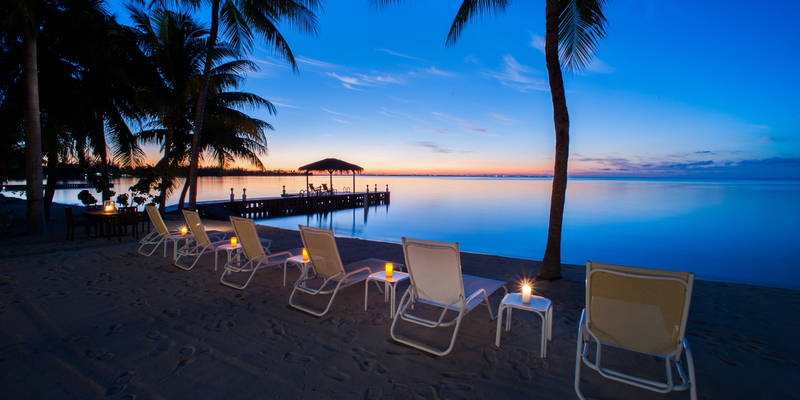 The benefit of booking with Grand Cayman Villas became very obvious. They know what they are doing.Cos Kai is a beautiful home. Each couple had a great bedroom and en suite bathroom. The kitchen is awesome. Two ice machine take away any ice worries. Huge screened in porch with bar and dining table for eight. Upper deck over the porch was great for sunset cocktails. Villa manager Claudia was there to greet us upon arrival and give us all info we needed. She also answered many questions before we arrived. The location is a big plus. Easy walk to Kaibo Beach Club and Rum Point. We took a mid afternoon private charter to stingray sandbar and 2 snorkeling spots right from Kaibo 5 minute walk. 1 minute drive.An easy one mile walk down our beach to starfish point was made many mornings. With sightings of rays, barracudas and more every day. And the many starfish at the point. Cos Kai is a nice starting point in either direction for morning walks as there is very little traffic .We are so happy we were here and NOT on Seven Mile Beach. We all did the Mastic Trail Thru the middle of the island one morning. Its only a 5 minute drive. And a quick 20 minute ride along north coast is a grocery and liquor store. Right across from Morritts. While there take a snorkel under Morritts dock to see the large school of tarpon and other fish.That should not be missed. I think you can tell we had a great time. Just wish our stay was longer. 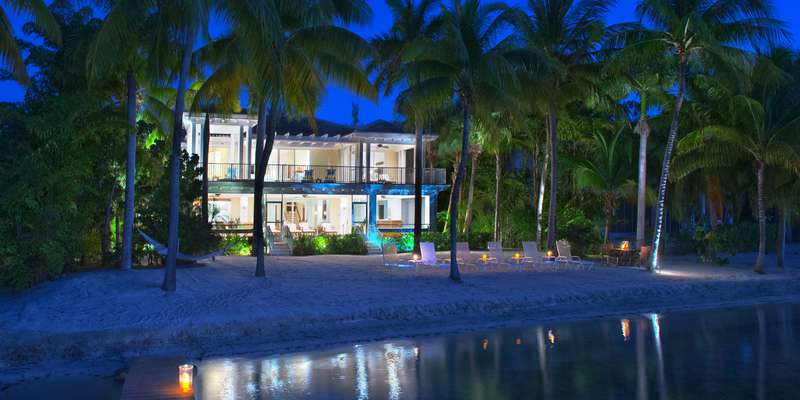 We would recommend Grand Cayman Villas and Cos Kai to anyone.